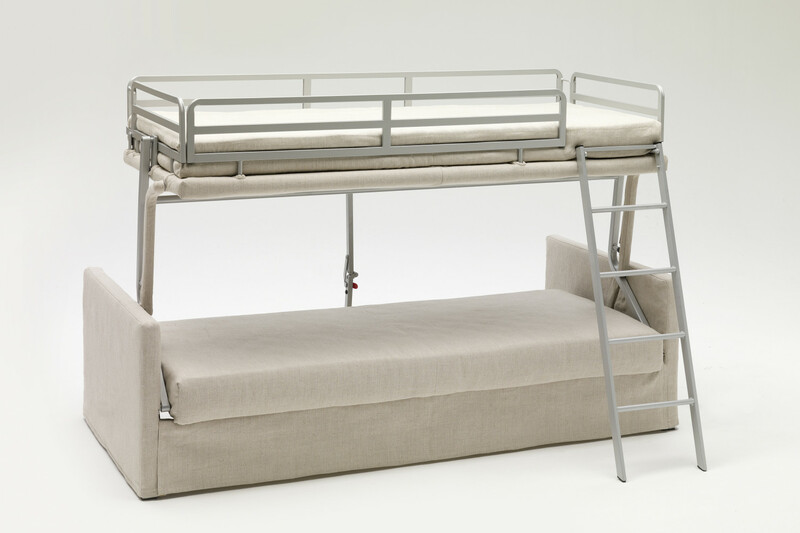 George is a modern sofa bunk bed with Lampolet mechanism. It is available as 3-seater and maxi 3-seater, and also with a third pull-out bed or big drawers. George is a sofa bunk bed; a functional, easy to open and resistant item, thanks to Lampolet mechanisms: by simply removing the cushions and lifting the backrest with a handle, this 3-seater sleeper bed turns into 2 single bunk beds. Available in two widths, it includes comfortable mattresses with a width of 80 cm and a length of 190 or 200 cm. Moreover, these mattresses are available in several models suitable to satisfy any comfort need. A bunk bed is the right solution for narrow environments and holidays homes, or to furnish a small guest room. 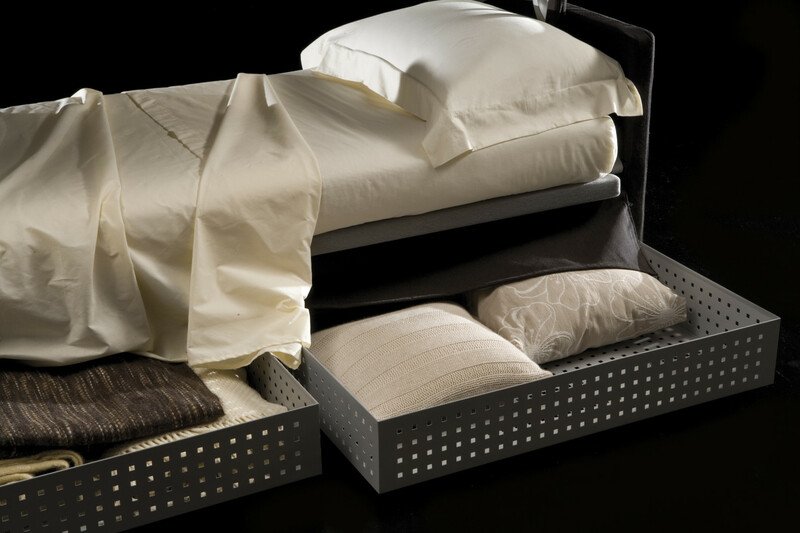 To use the space available in an even better way, it is possible to equip George with a third pull-out bed base, or two capacious big drawers, placed underneath the sofa bed base. George is certified by CATAS, a laboratory specialised in analysis for the wooden furniture industry intended to verify the safety, resistance and durability of furniture products. The two beds are equipped with 12 cm high single mattresses with a depth of cm 190 or 200, depending on the sofa model selected. Other models with pocket springs or in polyurethane are also available. The sofa is available in fabric, eco-leather and leather in all the colours displayed in the samples page. The cover is completely removable. The sofa can be completed with a pair of cm 58 x 34 rectangular cushions. 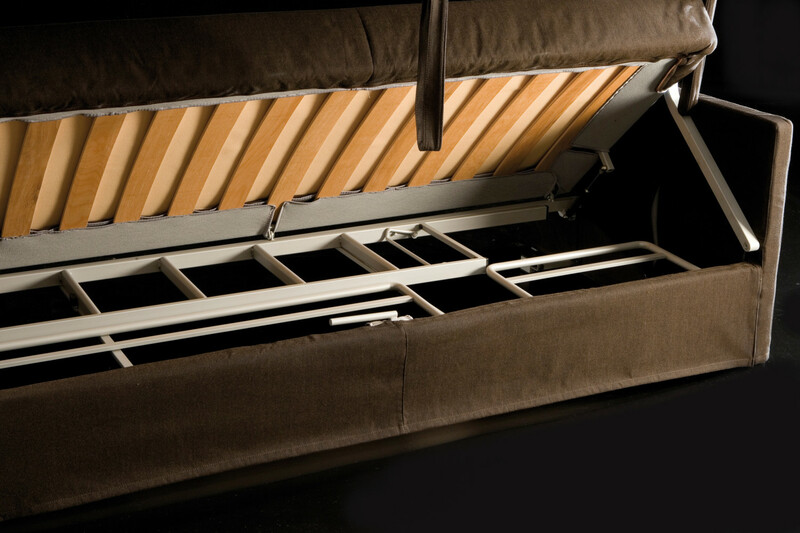 As a standard the sofa bed is equipped with a stepladder and safety bed rails. 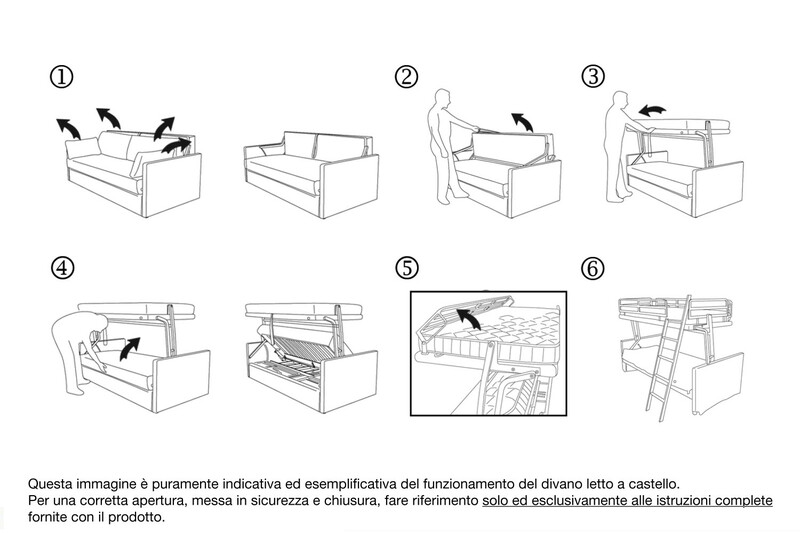 These safety elements must be mounted on the upper bed frame as shown in the assembling instructions. 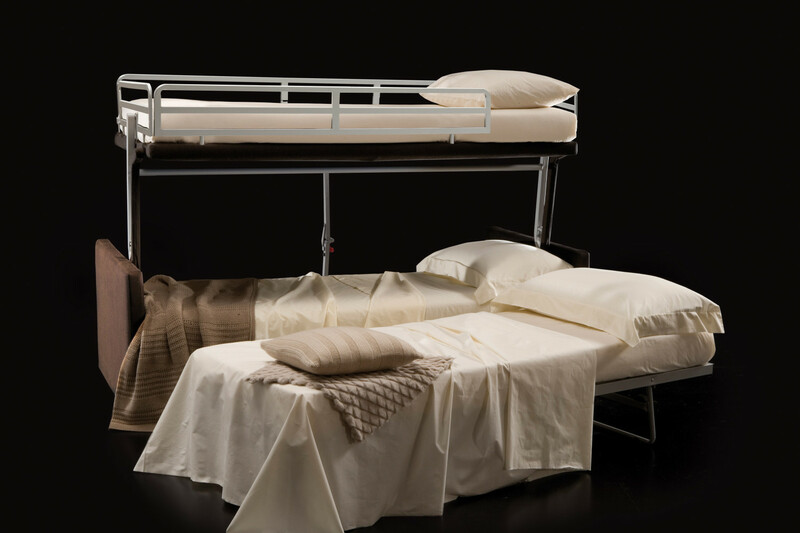 All George sofa bunk bed characteristics and safety measures have been designed by Milano Bedding and certified by CATAS in compliance with strict and severe European regulations. You can find more information inside the Technical Card or download them from the additional information box on the right. Mechanism or structure: high resistance furniture tube, oven coated with epoxy powders. Orthopaedic bed base. Standard mattresses: 30 kg/m 3 expanded polyurethane, covered on top with 100% CO fabric quilted with 200 g/m² 100% PL resin fibre, on the bottom with 2,5 mm 3-layered interliner. 100% CO fabric band quilted with expanded polyurethane. Backrest: 21 kg/ m³ expanded polyurethane covered with 3-layered interliner. Structure: interliner combined with mm 10 expanded polyurethane. Backrest cushions: 100% hypoallergenic polyester flock covered with 100% cotton muslin padding. 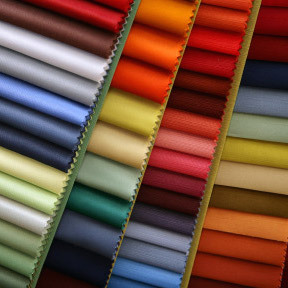 Quilt: bottom cloth: polyester/cotton; 100 g/m² resin polyester wadding padding. Certifications: the sofa bed respects all the dimensions and safety requirements and is thus compliant with the UNI EN 747-1 regulation on bunk beds safety and 2:2007 on resistance, safety, stability and durability. The certificate has been issued by CATAS. The UNI EN 747 regulation on bunk beds requires edges and corners to be always rounded; the structure cannot have tubes with open ends and it cannot be possible to disassemble it without specific utensils; the bed must be equipped with safety rails without openings with the exception of the section necessary to reach the mattress. Moreover, according to these regulations, bunk beds must be tested for the use of adults (under 100 Kg) and are thus subjected to loads and stresses fitting a daily use from adults and children. 1) Before beginning any kind of operation, make sure that there are no persons, animals or objects nearby. 2) Children could get stuck between bed and wall; to avoid severe injuries, the gap between the safety rails won't have to be more than 75 mm or will have to exceed 230 mm. 3) Children under 6 years old must not use the upper bed to avoid risking to falling down and get injured. 4) Children could strangle themselves with elements like ropes, laces, cables, lashings and belts fixed or hung to the upper bed, for this reason when the bed is open the handle to open the bed must be always removed. 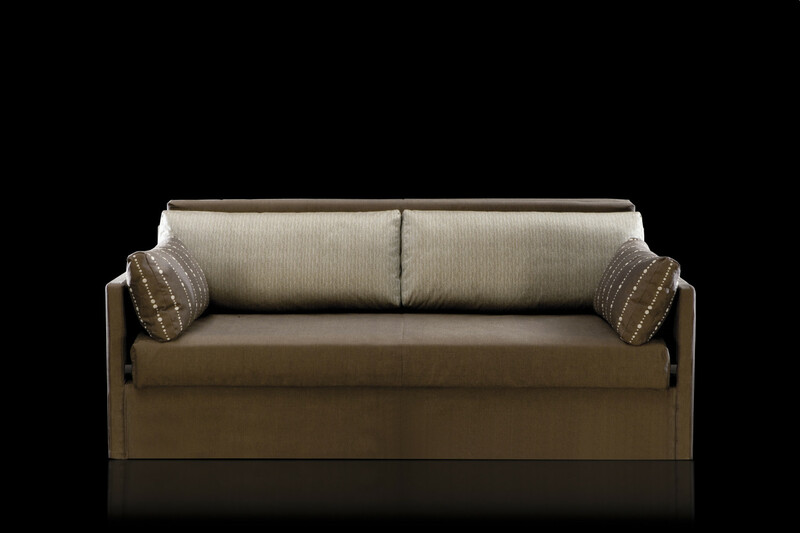 - for cm 223 sofa: upper and lower bed cm. 80 d.200 h.12 / pull-out bed cm. 75 d.200 h.12. In order to guarantee to use the bed in the best safety conditions possible, it is forbidden to use mattresses not supplied by the manufacturer. Milano Bedding mattresses for George sofa bunk bed are in fact specifically designed to make the bed base adhere to the mattress in the right way, guaranteeing the respect of the specific safety measures. 6) Before using the upper bed, position and fasten all the safety rails and carefully attach the stepladder to the structure. 7) It is forbidden to use the product in case of lack or breakage of any structural part. 8) The upper bed has been tested to bear up to 100 Kg, thus people over 90 Kg are advised against using it, and people over 100 Kg are forbidden to use it.